Despite making Star Wars characters out of old cereal boxes as a youngster Chris Taylor didn’t turn his fascination with interstellar travel into a career. Instead he did the next best thing and became a potter. Chris decided to return to London and undertake a Masters at the Royal College of Art and whilst doing that he won a scholarship that stipulated that he must use the money to travel. For Chris the obvious choice of travel location was Jingdezhen in North-eastern China. It is known as the ‘Porcelain Capital’ and although he believed that it was the enormous output from that city that had put so many British and Western potteries out of business, he knew that there was much he could learn there. Finding a whole street of glaze shops he fell in love with some of the techniques used to create very individual finishes. ‘If you want pattern under the glaze you can buy these print sheets on tissue that go straight onto the green ware’ he explained. ‘I bought a load of these and totally fell in love with them, they bleed into the glaze.’ Unable to avoid the clutter of advertising on the walls and as Chinese is quite a pictorial language he was influenced by the façade. ‘I couldn’t read it and it all became like patterns and textures’ he said. Although it was just a mess of posters but he found it quite beautiful. 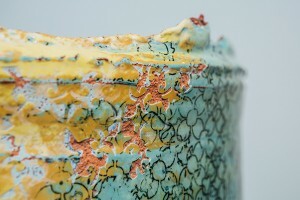 Today Chris is a lecturer in Ceramics on the Contemporary Crafts Degree Programme at Plymouth College of Art. Despite the traditionally solitary image associated with his craft he enjoys the interaction with his students. ‘You’re in an environment full of people that are interested in the same things as you’ he says. Teaching and talking to people about making is what he enjoys. He believes that Britain has a lot to offer the world in terms of quality and depth explaining: ‘In Britain we’ve got a great reputation for the thinking behind making’. Chris Taylor will be selecting three people from the entries to the Ceramics and Glass category of this year’s Marshwood Arts Awards.